Checkmate? Next page - back to the Spike & Twilight arc. & Incarno -- all names will be included in special edition of this comics! Man...Sombra has such good lines, and that last one is really chilling. A fitting, suspenseful end for this page. Beautiful job with the coloring and lighting in the top panels. This comic is so close to the actual show's that I can honestly see it passing as the actual thing! Good job! : If I destroy the horn, would you die? : It would be extremely painful. : You're a big guy. Come on, Sombra, don't you know the rules of chess? A stalemate means nobody loses. 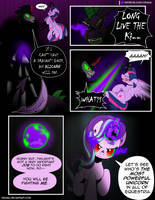 Hmm, what is Sombra afraid of? That was clever! It seems like they have Sombra where they want him, but what else does he have planned? You're fighting evil. What do you expect? I have been confused since the beginning of the final battle.... Has Sombra been inside Spike or Starlight? Woah... That's deep. Thanks for straightening this out! I think that he's corrupted Spike, but is using Starlight as a host now. if i going down, i'm taking you with me! Ok, now that is a good use of Starlight's magic. Ominous though. 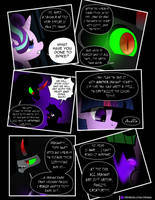 Canon Sombra had a plan that would trap the Crystal Heart with the pony that tried to retrieve it, has he done something similar here? Ok, badass yet ominous page. Hopefully things are going well with Spike too. Well isn't that cutie mark removing spell handy now and then. By the way, is her cutie mark has red color because of Sombra's influence? Although it is not good to believe yourself smarter than an evil king. Starlight made a big sacrifice to protect everyone. Your sacrifice won't be in vain! Now it's up to Twilight and Spike to do their part. I think this theme could work with today's page. I love your drawings and comics. If MLP ends this year. Whoa, that was clever of Starlight, using her cutie mark removal on herself! Also, I love Sunburst's attitude here and how he's resisting Sombra's wiles. Though now I gotta know what Sombra means that everyone is going to lose. It's clear he either has a Plan B, or there's something I missed. This isn't checkmate; they're not out of this yet. Actually doing what she refused to do in Season 5. 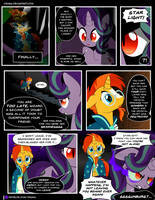 Of course Sombra is a poor loser. Chin is dead. Hong Kong 97. Also wow, I didn't realize how fast you released these. That's probably how fast you've had so many pages out already. This is so awesome, keep up the great work. Careful Sombra, sometimes a stalemate can be broken. "and we are ALL going to lose" So sombra has a self-destruction contingency plan?